Global Gas Generator Sets Market size was valued over USD 5 billion in 2018 and is set to expand over 8% by 2025. Global gas generator sets market will witness robust growth on account of growing stringency of environmental compliances along with increased focus on cleaner fuel sources and energy efficiency. For instance, in June 2018, the State Council of China introduced the GB 19147-2016 emission standards limiting the sulphur content to ≤10 mg/kg for nonroad engines effective from January 1, 2019. Additionally, the relative competitiveness and stability of natural gas prices will further accelerate the product deployment over the coming years. Ongoing boom in the unconventional gas resources, most notably the U.S. shale gas revolution in addition to tightening emissions regulations will stimulate the gas gensets market size. The commercialization of these gensets is set to gain robust momentum as increasing number of countries seek to exploit the unconventional gas resources. However, these developments will materialize on a longer term as several developing countries are still dependent on diesel gensets for basic power needs. Expanding LNG infrastructure favoured by several regulatory policies will further complement the business expansion. >750 kVA gas generator sets market is will witness robust growth on account of surging demand from power intensive business sectors including data centers, manufacturing industries, and large commercial centers. Increased data usage through social networking, e-commerce platforms, smartphones, and government projects will significantly favor the infiltration of these units across the business landscape. The industry growth is further attributed to the growing dependency of businesses and industries on digitization and information technologies, which necessitate the continuous and uninterrupted power supply. 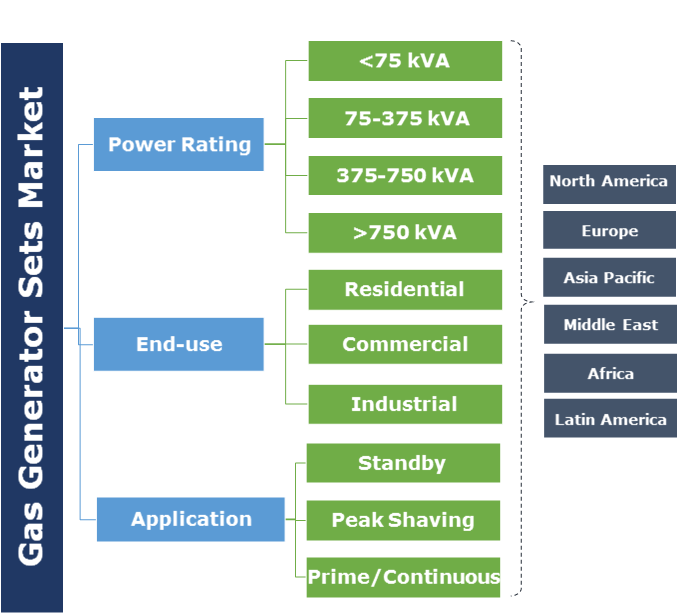 The 75-375 kVA gas generator sets market size is set to grow over 9% by 2025. The ability of these systems to adequately cater to the energy requirements of commercial and light industrial establishments will boost their penetration across the business landscape. Growing investments toward development of small & medium scale industries will further propel the deployment of these units. Residential gas generator sets market is anticipated to grow over 8% by 2025. Growing demand for reliable and continuous power supply along with increasing dependency on backup power solutions during temporary grid disruptions will significantly boost the adoption of these units. Increasing number of natural disasters and ageing grid infrastructure will further strengthen the demand for these units. Ongoing investments toward the development of commercial centers along with increasing financial losses of power outages will drive the commercial gas generator sets market size. According to the U.S. Department of Defense, average cost of 127 power outages faced by them in 2015 is nearly USD 180,000 per day. Furthermore, growing urbanization and rapid population growth will positively influence the product deployment. 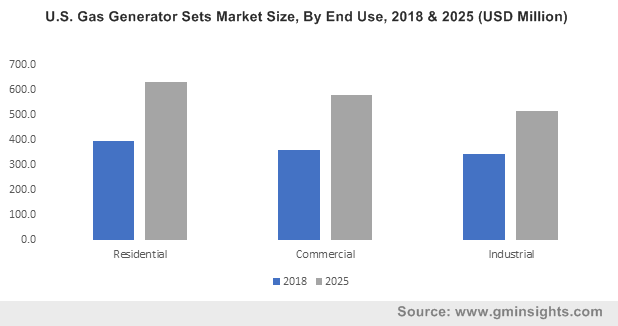 Strengthening demand for a consistent power supply coupled with elevating costs associated with power interruptions across the commercial environments will boost the standby gas generator sets market. Moreover, progressive technological advancements primarily in terms of engine modifications to conform with the increasingly stringent emissions standards will further favor the industry dynamics. Prime power gas gensets market size is set to expand over 9% by 2025. These gensets find predominant applications across the industrial sector to provide high load requirements. Industries including mining, oil & gas, and construction hold a widespread deployment potential for these gensets. The proliferating industrialization and infrastructural development across the emerging economies will strengthen the product demand. North America market is anticipated to expand over 6% by 2025. Abundant availability of natural gas favored by an expanding LNG infrastructure and shale gas boom will favor the industry growth in the region. Additionally, increasing intensity & frequency of weather-outages coupled with ageing grid infrastructure will boost the product adoption. For instance, in October 2018, grid disruption caused by category 4 Hurricane Michael affected approximately 2.5 million electricity consumers in Florida Panhandle region. Asia Pacific gas generator sets market size will expand over 10% by 2025. Resurgent natural gas infrastructure development supported by a multitude of financial institutions & regulatory bodies will stimulate the regional industry growth. For instance, the Asian Development Bank, in collaboration with the China Gas Holdings, has expanded the natural gas pipeline network, adding distribution infrastructure to over 100 cities in the China. Stringent environmental norms and ongoing efforts to curb the increasing effects of global warming coupled with ongoing investments toward development of gas pipeline infrastructure will drive the Europe market size. For instance, in March 2018, the European Investment Bank approved a loan of USD 1.15 billion toward the development of a part of USD 40 billion Trans-Anatolian Natural Gas Pipeline (TANAP). Prominent industry players operating across the global market include Generac, Briggs & Stratton, Cummins, Mahindra Powerol, Caterpillar, Himoinsa, MTU Onsite, Kohler SDMO, Clarke Energy, Stemac, FG Wilson, Cooper Corporation, and Genmac amongst others. Regulatory conformation, brand recognition, cost competitiveness, technological innovations, product assortment and extended service & distribution network are the vital strategic assets for an industry player to attain a competitive edge across the marketplace. A gas generator set, also known as genset may be defined as an electrical equipment comprising a generator, a gas engine, and other ancillaries, which produce electrical power. The product is primarily deployed to supply emergency power during a grid failure or to provide primary power in sites where grid access is unavailable. Increasing dependency on electricity and security of supply will stimulate the product demand across residential, commercial, and industrial applications.